Hey, guys! This has been sitting in my drafts for so long. I was supposed to recap Baby-Faced Beauty for Dramabeans but then I wasn’t able to because of school. I became so busy that I wasn’t able to do the recaps on time. I’ve done recaps until episode 7 and I don’t think I can finish the full drama. So I’m just posting episodes 5 to 7 since they’ll just be rotting here so better to let the world see. And if ever someone reads this, maybe s/he will be interested in BFB, or better yet, kdramas, and watch the show or more dramas. So, enjoy! With Jin-wook arrested, the scandal with Manager Ahn spreads like wildfire. Executives are having a meeting regarding the scandal and Seung-il refuses to be involved with Jin-wook, business first aka we can’t let Rosemary Department Store withdraw the contract. We know that So-young went to the department store to plead with Manager Ahn for mercy on Jin-wook’s behalf. She causes half a scene, kneeling and begging and clinging to Manager Ahn’s leg, when Yoon-seo comes. Yoon-seo pulls some strings to release Jin-wook without any charges filed against him. Back at the office, Yoon-seo blames So-young while no one seems to take responsibility or even back her up. So-young just accepts it and says sorry. Seung-il gets a phonecall from his lovely daughter, Hyun-yi (played by Ahn Seo-hyun, Hye Mi’s adorable Jin-gook-kissing sister in Dream High). She is in the office but nowhere to be found. She is wandering around the building and finds herself entering the designer’s studio. She sees Nara’s makeup kit and starts to play with it. Attagirl! Nara realizes her cosmetics bag is missing and she orders So-young to find it. So-young finds Hyun-yi alone in a room playing with it, dolling up her, well, favorite doll named Jessica. 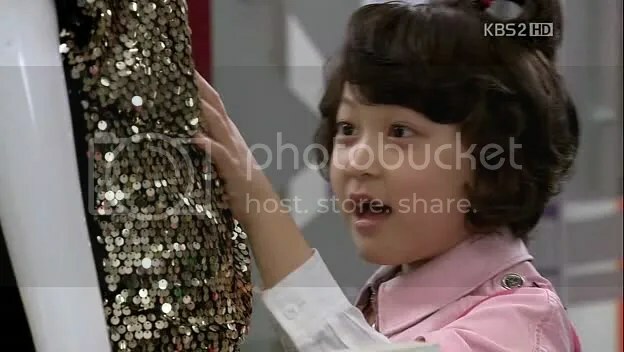 So-young asks for the cosmetic bag but this girl ain’t like the lovely little lass she was towards her father. She tells So-young that she’s the President’s daughter but So-young doesn’t believe it until Hyun-yi shows a picture of her with Seung-il. So-young racks her brains out to find a way to be in Hyun-yi’s good graces to get the makeup bag. She gives Hyun-yi a cloth ribbon and ties it to Jessica’s hair and gets Nara’s bag. Hyun-yi cries her way into manipulating So-young to be her model. So-young has no choice but to play beauty salon with Hyun-yi. Meanwhile, Seung-il’s searching for his daughter high and low and finds her with So-young… all clowned up! He is pretty amused seeing her daughter play beauty salon and stops Yoon-seo from interrupting the scene. So-young gets the kit and excuses herself but no one comes and goes in a beauty salon without paying! Hyun-yi asks for a fee and Seung-il eyes So-young and she pays Hyun-yi 1000 won. Jin-wook sees Clown So-young at the corridor and laughs at her when Seung-il shows up, repaying her 1000 won. Jin-wook is curious but So-young just leaves it there. Yoon-seo is so not liked by Hyun-yi, natch, she is absolutely hated. 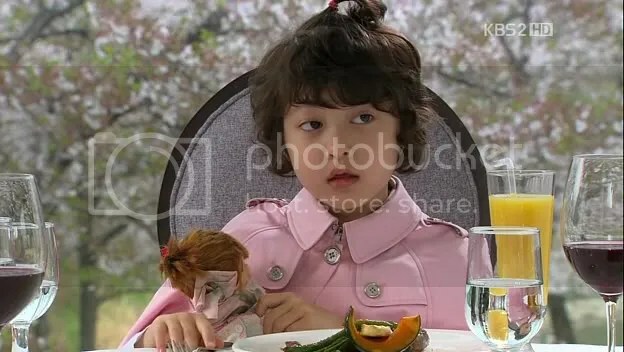 Hyun-yi happily mentions So-young on the dinner table as the fun ahjumma who gave Jessica a pink ribbon and asks why her father didn’t bring her over. It becomes sort of awkward and tense and Seung-il is saved by THE PHONE CALL. Hyun-yi just tells it straight to Yoon-seo. I love this girl! It’s so fulfilling to watch that it’s only with Hyun-yi that Yoon-seo can’t get her way. 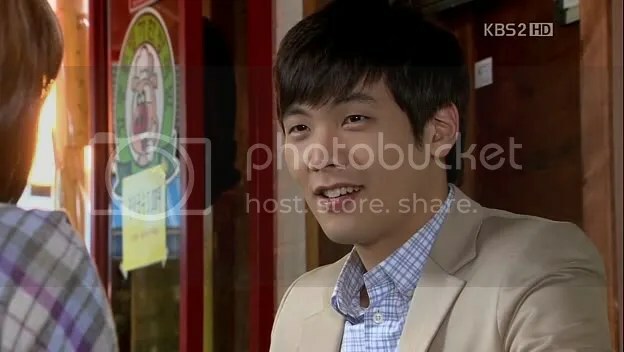 So-young treats Jin-wook to lunch and they eat at a jokbal (pigs’ feet cooked with soy sauce and spices) restaurant. Jin-wook absolutely hates it because of its smell but So-young opposes that they taste and smell good. Jokbal is definitely a touchy subject with regards to Jin-wook, me smells. Jin-wook says there’s nothing good about a pig trotter restaurant. He says it’s even embarassing for a man to tell the girl he’s dating that he owns a restaurant as such. So-young casually disagrees and tells him that it’s her dream to marry a man who owns a jokbal restaurant. This somehow pleases Jin-wook. In some other place in the city, Seung-il’s sister Ji Joo-hee (played by Hyun Young) is listening to her friend who got cheated by her man, when they overhear a couple fight from a nearby table. It’s So-jin breaking up with her man when she learned that he’s married. The man begs her not to leave, saying he bought her so many things, but So-jin doesn’t even bat an eyelash. Joo-hee brought her friend to a singing class for ahjummas to which No Yong-joon (played by Yoon Hee-suk) is the teacher. He is SO loved by many ahjummas and he utterly HATES it. So he hired So-jin to introduce herself as his girlfriend. She introduces herself as The Style’s So-jin. Unfortunately, Joo-hee witnesses the scene and who feels this will cause another problem in the future? So-young is on her way back to the office after So-jin called her out to ask (more of grab) for some money and to return Seung-il’s umbrella when she sees Seung-il. She calls him, thinking she could return the umbrella outside the office to avoid any more misunderstandings. However, her heel gets stuck in a small hole in a sewage lid on the street. 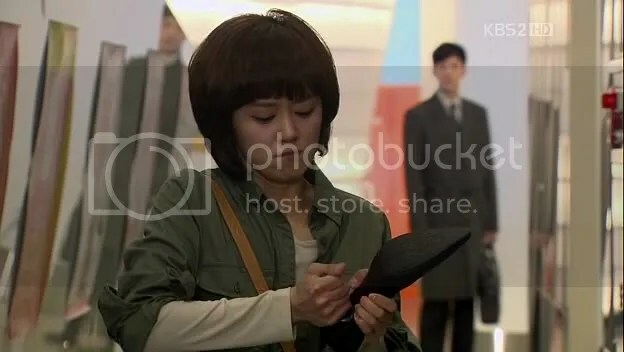 She struggles to remove it and Seung-il helps her get it out – only the heel detaches and she’s left with one heel-less shoe. She returns his umbrella and this whole exchange is seen by Nara and Mi-soon. When So-young arrives at the office, she’s about to lose her job. The angry wife of the man with whom So-jin just broke up with posted in the company forum that she’s a homewrecker. The scandal goes up to the executives. They’re having a meeting about the scandal and they’re thinking about firing So-young. Seung-il doesn’t seem too keen on the idea and Director Baek suggests hearing So-young first. Yoon-seo answers that she’ll make a decision after investigating since So-young’s part of her team. Oh, yeah right, an investigation will happen. No one seems to believe So-young, even Jin-wook. It hurts her more that Jin-wook says that he believes her but he actually thinks that she’s the kind of girl described in the wife’s hateful post. With everything going downhill, walking with one heel-less shoe finally frustrates her so much that she breaks the other heel so she can walk properly. Seung-il sees all of these and has a caring look as he watches So-young walk so sadly. So-young snaps back at her sister back home and there’s a GORGEOUS camera view employed. So-young lectures So-jin about seeing a married man and spending other people’s money. So-jin answers right back that if she’s so righteous, why is she using her name to earn money. So-young tells her that that’s about to change since she’ll be fired tomorrow for what So-jin has done. Jin-wook feels bad that he doubted So-young and he decides to take this matter in his own hands and conducts his own investigation. He looked for the man’s address and waited in front of his apartment all night long. The next day, So-young is ready to be fired. Director Baek sees her and eyes her sneakers. She doesn’t buy the rumor because of her sneakers and the fact that she makes her own clothes because clothes are expensive. Director Baek tells President Ji to think about the matter before acting on it, implying she doesn’t believe the scandal even one tiny bit. The married man finally shows up and Jin-wook blames him for the trouble he’s caused So-young. Jin-wook is manhandling him, when they realize that they’re talking about two completely different girls! Jin-wook shows the martini video and the man says that that is absolutely NOT the girl he dated. Yoon-seo doesn’t even listen to So-young’s explanation and fires her. Meanwhile, President Ji receives an email from So-jin’s married ex-boyfriend, stating that it was a misunderstanding and that the girl he dated conned him and told him that she was The Style’s So-jin. Seung-il goes to the designer’s studio only to come across to a fired So-young outside. He brings her back to the office and reinstates her in front of Yoon-seo and all the designers. Yoon-seo complains to Seung-il that he has just undermined her authority. Seung-il explains that the man just emailed him and says sorry. Good news but not really because everyone starts talking behind So-young’s back, gossiping that she must have also seduced President Ji to get her reinstated. So-young hears all of these and hides behind a column so when Yoon-seo invites everyone over for a night-out because of her frustration over the matter, she isn’t invited. So-young heads over to the patternmaking division and actually falls asleep while working on her designs. Seung-il sees her inside and becomes curious with her designs. But he can’t see it fully because a sleeping So-young is slumped in the desk. He tries taking the sketchpad out without waking her up, which of course wakes her up. Both are surprised and awkward air is wafting between them so Seung-il breaks the tense air by asking her to come along the design team’s gathering. So it comes as no surprise when everyone was surprised to see President Ji come to the club with So-young. They treat her like she’s invisible while So-young gets in an alcohol frenzy. Uh-oh. She gets drunk and starts to yell at everyone, not using any honorifics. She starts pointing her finger to every person in the room and venting her frustrations out. She calls out on Senior Designer Jang for being irresponsible for the previous scandal with Manager Ahn. She criticizes Nara for being Cruella De Ville. Everyone is shocked when she points her finger on Yoon-seo. Everyone tries to stop her but she continues her vent about what kind of a leader does not listen to her team member’s explanation first before firing her. President Ji finds what’s happening in front of him comical and Yoon-seo catches this and is mightily curious and irritated at the same time. Jin-wook comes with his sunbae and So-young sits him down and starts hitting his head. Jin-wook tries to stop her by saying that all the adults are there and that she’s supposed to behave and watch her language. But So-young counters that she’s also an adult. So-young: “Adult, I am also an adult. Do you know how old I am? 25? In fact I… My age is 34. There’s a 4 after the 30, get it? Jang Nara and Daniel Choi are so cute and adorable and compatible together. Their characters are both earnest and endearing! I find myself rooting for So-young every second I spend watching this drama and I want her to win in all aspects of her life. Jin-wook’s showing some maturing while still being goofy and childish. So-young even noticed it after the Manager Ahn fiasco. I love character developments! Seung-il and So-young continue having moments together, which I enjoy because anything that makes Yoon-seo’s hackles raised makes me one happy watcher. Mwahaha. I think Seung-il just views her as an interesting person as of now but when he sees more of the interactions between So-young and his daughter, he’ll see her as something more. But she’s definitely on his radar, for her talent and for her clumsiness. Ha! As for Hyun-yi, keep giving Yoon-seo hell! This kid has mastered the bossy princess act. Hee. The pace is swift and there’s no dead air, too much brooding and too much focusing on one character. The plot moves from one conflict to the next. In this episode alone, a lot of things happened, which makes me really satisfied. All the more, these conflicts brought by plot devices like So-jin feel organic to the story for me. It doesn’t seem contrived because it’s not highly unusual and coincidental. The camera always moves and I truly like that. The shots are so gorgeous and the director uses interesting views. This show showcases what the location can offer – stairs, conference rooms, shrubs, anything – and shoots from a different angle than what we’re used to which makes it more visually appealing. I don’t even need to increase contrasts, level and brighten up the screencaps because they are lovely by themselves. I agree with javabeans that the drama is about more than just a romance at the center. I find it nice that they didn’t make us eat romance right from the start but they actually focused more on the workplace issues first. It’s better to see how the leads form friendship bonds first which will evolve into a love line later on. I personally revel in banter-friendship-love stories so this is really my cup of tea.